He is also seen on video kicking and punching the man. York Region police Const. Michael Partridge pleaded guilty to assault for sending his dog on a suspect who was lying down with his hands on the ground. TORONTO — A Toronto-area police officer pleaded guilty to assault after siccing his K-9 unit dog on a man who was lying down awaiting arrest. York Region police Const. Michael Partridge admitted to his role in the assault that occurred on March 30, 2016 and left a man with minor injuries. Partridge was originally charged with assault and assault with a weapon — the weapon being the dog, but he pleaded guilty to one count of assault on Wednesday, the day his trial was scheduled to begin. York police had been investigating break-and-enters in the region and had identified three men who had allegedly committed the crimes, according to an agreed statement of facts read in court. Various officers began surveilling the men that day and watched them allegedly break into one home in Brampton, Ont. The officers followed the men to a condominium near the Gladstone Hotel where they were met by several Toronto police officers. Around 3:30 p.m., one of the suspects was arrested after he walked out of the condominium and a subsequent search revealed a baggy with loose ammunition. Partridge was on scene with his police dog, Lex, to support the arrests, court heard. Officers then received information that another suspect had entered the condominium with another man, both of whom bolted when officers tried to arrest them. Three officers quickly caught one of the suspects, but the other had gotten away. Several officers then began searching for him when bystanders on a rooftop pointed in the direction of a running man. 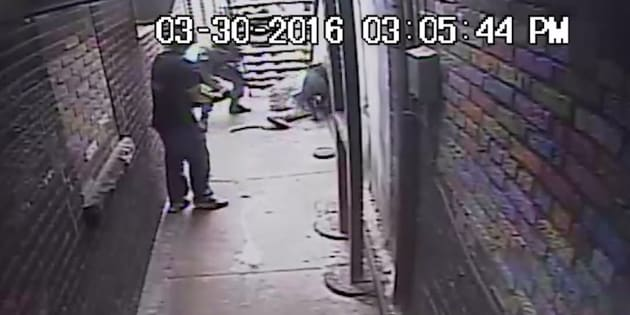 The suspect — Median Jackson — sprinted into an alley, and lay down, winded, near a set of stairs, which was captured on surveillance video from the Gladstone Hotel. That video was filed in court as an exhibit. In the video, York Region police Const. Matt McLean arrives and orders Jackson face down until help arrives. Court heard that the officer didn't have his handcuffs because he had used them on one of the other suspects. "Jackson was compliant, lying face down underneath the stairs,'' Crown attorney Peter Scrutton told court. Partridge did not know the suspect was on the ground obeying the officer's orders when he yelled out "Police, K9, you're under arrest, come out,'' court heard. Almost immediately, Partridge released the dog before he knew Jackson's whereabouts. The dog bounded into view on the video and bit down on Jackson's arm and began thrashing its head back and forth. Partridge then began kicking and punching Jackson who had recoiled underneath the stairs. "While these strikes did not cause any injury, they appeared to have served to incite the dog, which continued to grip and bite Mr. Jackson's arm,'' Scrutton told court. Jackson suffered minor injuries from the incident. He was initially charged with break and enter and breach of probation, but those charges were later dropped due to Partridge's actions, said Jackson's lawyer, Morrie Luft. "Having heard the facts, in my view this would be an error of judgement, perhaps through inadequate training, rather than being premeditated or a loss of temper,'' said Justice Harvey Brownstone. Partridge said little during the proceedings, and his lawyer declined comment. The officer is scheduled for sentencing on Sept. 27. He also faces three Police Services Act charges, including two for discreditable conduct and one for unnecessary exercise of authority. Correction: An earlier version for this story referred to Const. Michael Partridge as a "Toronto Officer" in the headline. He is a Toronto-area police officer. This version has been updated.